Life cycle: Numerous generations per year. Hibernation occurs in the egg stage in the winter. Eggs are laid on bark. Plants preferred: Apple, quince, and pear. 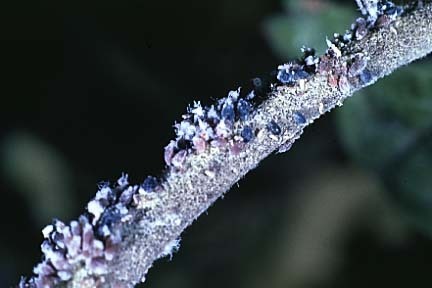 Feeding characteristics: This aphid appears as masses of white, cottony material on the tree trunk and limbs. Large nodule growths appear where aphids have been feeding for several years. This aphid can also be found on the roots where it then migrates to the trunk and branches causing saplings to become stunted. Physical Description: This insect is a light purplish color and is covered with a white or bluish white, cottony substance. The aphid is 1/10 inch long and lays its eggs on the bark. Controls: Spray the tree trunk and limbs with dormant-oil spray in early spring, or spray thoroughly with soapy water in the summer months. For infestations of the roots, try soaking the base of the trunk with a soapy spray. The Chalcid Wasp (Aphelinus mali) is the insect's natural predator. For serious infestations dust with sabadilla.